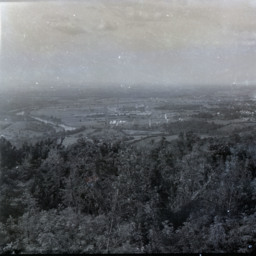 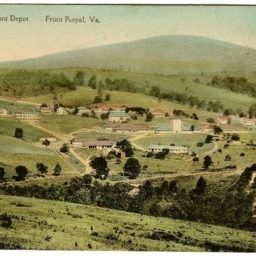 Photograph showing the American Viscose Corporation Plant in Front Royal Virginia and surrounding landscape as seen from an elevated position. 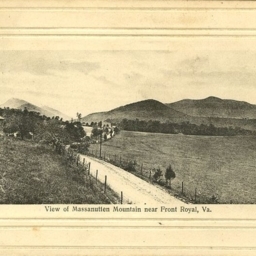 View of Massanutten Mountain near Front Royal, Va.
Postcard with a picture of the Massanutten Mountain taken from near Front Royal Virginia. 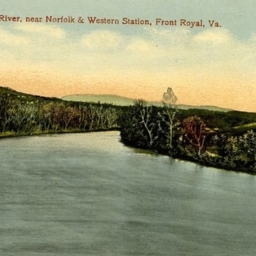 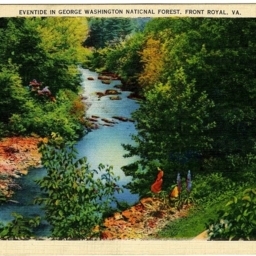 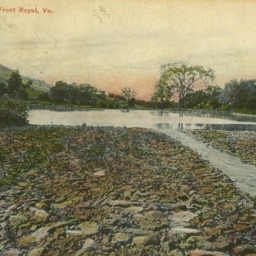 Color postcard with a picture of Front Royal Virginia's reservoir. 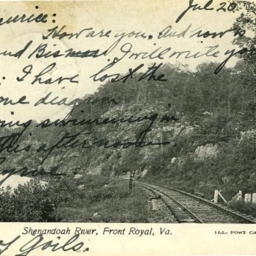 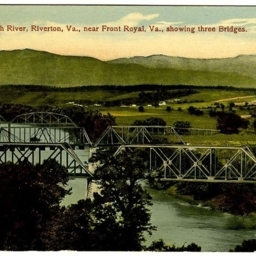 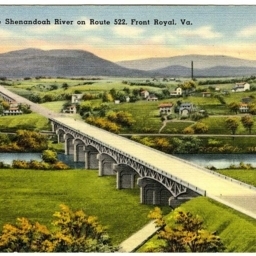 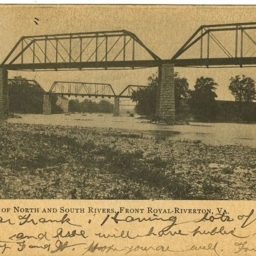 Postcard with a picture of a railroad track running along the side of the Shenandoah River near Front Royal Virginia. 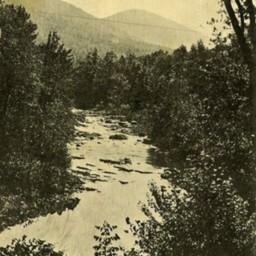 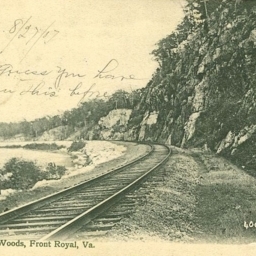 View at Cave Woods, Front Royal, Va.
Postcard with a picture of the Shenandoah River and railroad tracks near Front Royal Virginia. 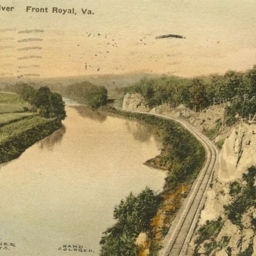 Shenandoah River, near Norfolk & Western Station, Front Royal, Va.
Color postcard with a picture of the Shenandoah River near Front Royal Virginia. 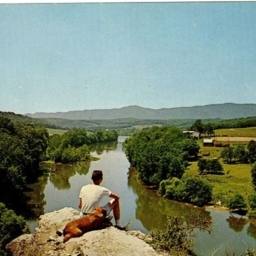 Color postcard with a picture of a boy and dog overlooking the Shenandoah River at King's Eddy in Warren County Virginia. 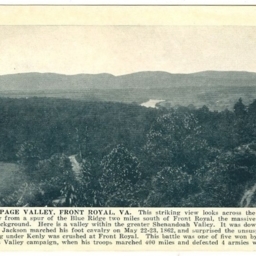 Panorama Page Valley, Front Royal, VA.
Postcard with a picture of the Page Valley taken from near Front Royal Virginia. 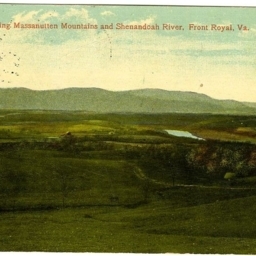 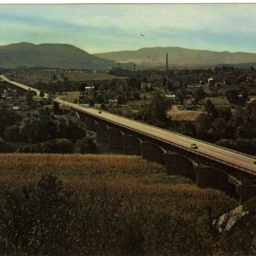 Scene showing Massanutten Mountains and Shenandoah River, Front Royal, Va.
Color postcard with a picture of the Shenandoah Valley, Shenandoah River, and Massanutten Mountain near Front Royal Virginia. 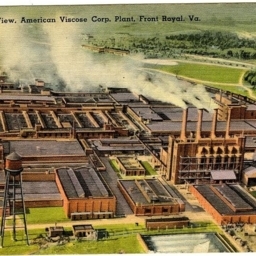 Aerial View, American Viscose Corp. Plant, Front Royal, Va.
Color postcard with a picture of the American Viscose plant in Front Royal Virginia. 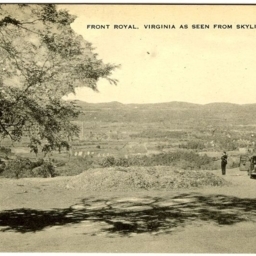 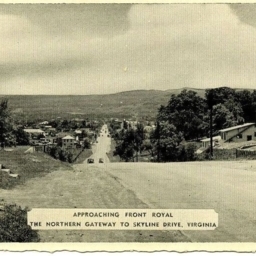 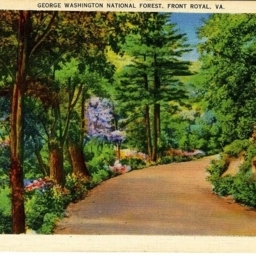 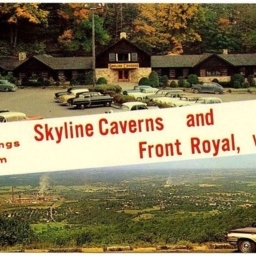 Postcard with a picture of Front Royal Virginia. 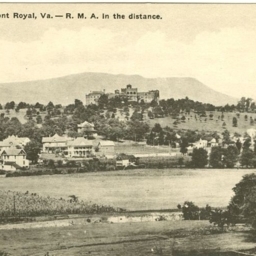 Postcard with a picture of Front Royal Virginia and Randolph Macon Academy. 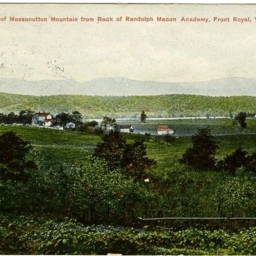 View of Massanutten Mountain from Back of Randolph Macon Academy, Front Royal, Va.
Color postcard with a picture of Front Royal taken from the back of Randolph Macon Academy. 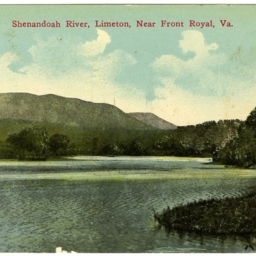 Shenandoah River, Limeton, Near Front Royal, Va.
Color postcard with a picture of the Shenandoah River near the Limeton community in Warren County Virginia.